Whether you are planning to have an intimate wedding or an exorbitant one, Vaishnav Banquet will surely match your unique choice, budget, and requirements. With a capacity of accommodating up to 275 in seating and 1000 in floating, the venue has a cosy and comfortable interior for the guests. It also offers an in-house team of caterers that puts all the efforts to delight the guests with mouth watering multi-cuisine dishes. Service is excellent. This is an amazing venue for any social function. The managers and staff are very friendly. At the same time the food and decor also was great and above our expectations. We thank WEDFINE for suggesting us such a great venue. The venue completely fitted in our budget and complemented our event. I certify that this review is based on my own experience and is my genuine opinion of this hotel, and that I have no personal or business relationship with this establishment, and have not been offered any incentive or payment originating from the establishment to write this review. I understand that TripAdvisor has a zero-tolerance policy on fake reviews. We have already contacted you through SMS. Vaishnav Banquet, Kandivali, Mumbai is a perfect venue for all your wedding and pre-wedding ceremonies. The classy pillar less banquet at Vaishnav is best suited to plan a fabulous sangeet and other pre-wedding functions as well as an intimate wedding reception but if a big fat Indian wedding is what you have on your mind, it can best be executed in the lawn space. Vaishnav banquet takes care of all your event needs with its team of Chef's who ensure mouth watering vegetarian cuisines while the creative decor team can personalize any kind of decor based on your wedding theme.Whether its getting the right music for your sangeet or slow ambient music for your reception, everything is well managed by their management, leaving you and guests to relax and enjoy your special occasions. Venue does not allow outside caterers. Venue does not allow outside decorators. Venue does not allow outside DJ. Venue does not allow alcohol. Venue is available in the following time slots: 07:00 a.m. - 03:00 p.m. (Morning) 05:00 p.m. - 12.00 p.m. (Evening) Changing rooms are provided to the bride and groom. Charges applicable. The venue has a parking capacity for 10 vehicles and provides valet services for a charge of Rs. 4,000 for 3 Drivers. The nearest railway station is kandivali Station. Landmark:Opposite B.M.C hospital. Vaishnav Banquet, Marriage & Party Hall, Kandivali West, Mumbai is a perfect venue for all your wedding and pre-wedding ceremonies. The classy pillarless banquet hall at Vaishnav is best suited to plan a fabulous sangeet and other pre-wedding functions as well as an intimate wedding reception but if a big fat Indian wedding is what you have on your mind, it can best be executed in the lawn space. Vaishnav banquet, Kandivali serves delicious pure vegetarian food for their guests to gorge on. The decor team takes care of the decoration for your big day allowing you to sit back to enjoy your function. Vaishnav Hall Kandivali takes care of all your event needs with its team of Chef's who ensure mouth-watering vegetarian cuisines. The creative decor team can personalize any kind of decor based on your wedding theme. Whether it's getting the right music for your sangeet or slow ambient music for your reception, everything is well managed by the Vaishnav Banquet Hall management, leaving you and guests to relax and enjoy your special occasions. The venue has two-time slots you can choose the one which suits you the best. It has a lush green lawn which is ideal for a lavish reception ceremony while the banquet hall is great for an indoor wedding. 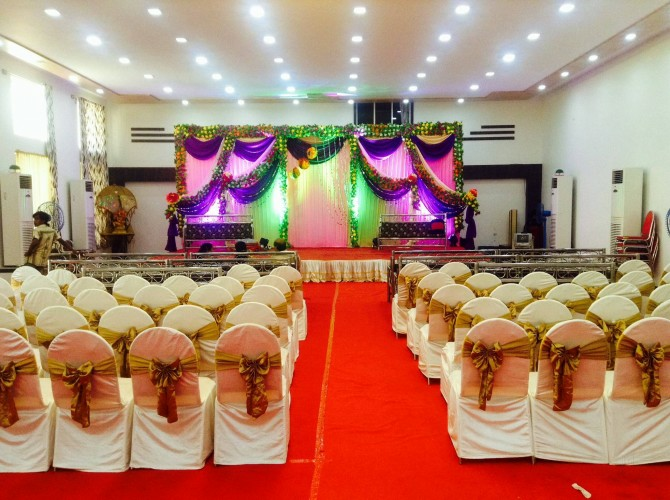 Vaishnav Banquet, Marriage & Party Hall, Kandivali West, Mumbai offers complimentary changing rooms for the bride and the groom on their special day.